“You should try and make homemade funfetti cake!” “OK!” This is verbatim how the conversation with my good friend MaryKate and I went down. Didn’t have to ask me twice! MaryKate and I had this conversation about a month ago now, but it wasn’t until this past weekend where I had a chance to write out a recipe and get to baking. Last Saturday it rained all day, morning to night. My absolute very favorite time to bake is early on Saturday mornings. Despite going to bed at 2am the night before, I woke up at 7am (I’m a psycho, I’m aware). I made breakfast, made tea, watched an episode of The Pioneer Woman in bed and then got to baking on my perfect little rainy Saturday morning. Only good things happen on weekend mornings. And this cake was a result of that. The funfetti came out extremely delicious and indulgent. It’s slightly more dense than the light and fluffy from a box mix, but I prefer that. Slather on some homemade buttercream frosting and you have yourself a fun little cake. Preheat your oven to 350 degrees. In a 9x13 cake pan, spray with cooking spray and coat with flour, set aside. Whisk dry ingredients in a large bowl and set aside. In an electric mixer fitted with the paddle attachment, beat sugar and butter until fluffy, about one minute on high. Scrape the sides and beat for a few more seconds. Add in egg whites. Combine wet ingredients (milk and extracts) in a liquid measuring cup. With your mixer on low, alternate wet and dry until fully combined. Pour in prepared pan and bake for 25-30 minutes, or until a toothpick comes out clean. Let cool completely. Once cake has cooled, time to make the frosting. In an electric mixer fitted with the paddle attachment, beat all frosting ingredients until smooth and desired consistency. Flip your cake out of it’s pan, top down, and on to a serving tray. Spread the frosting over the top of the cake in big swoops and sprinkle with extra sprinkles! Cake stays good in the fridge for up to a week! Between all of our back and forth emails and texts about implementing MailChimp, importing Disquis, editing URLs and formatting posts, Peyton and I exchanged a few non-blog related conversations. She told me she had a great recipe for me if I wasn't pumpkin-ed out yet. Pumpkin-ed out, ha never. This recipe is decades old and comes from an old church cookbook of her mom's. All good recipes derive from some old church pot-luck party. I made this cake to pair with Sunday night dinner. And it's just like oh so dang amazing. I think it even converted my brother-in-law into a pumpkin fan. He says he doesn't like "orange food"... we don't claim him sometimes. Pumpkin, sweet potatoes and butternut squash are all very important foods in my life. The whole cake gets flipped over making the buttery pecan crumb layer the base. The pumpkin cake layer gets sandwiched in the middle and is almost like a layer of pumpkin pie. Slap on cream cheese whipped frosting and you've got a cherry on top. This cake is getting put in the repeat recipe box ASAP. Preheat oven to 350 degrees. Line a 9x13 dish with wax paper. Melt your butter and set aside to let cool. Whisk the first five ingredients together and pour into your dish. Evenly distribute the dry cake mix over the pumpkin mixture. Sprinkle in the chopped pecans and lightly pat them into the cake mix. Pour your cooled butter over the nuts then bake for 50-60 minutes. Let cool. Using an electric mixer combine the frosting ingredients. Once the cake is cooled, run a knife along the edges. Invert on to a tray and remove the wax paper. The crumb part will now be on the bottom. Frost and decorate with pecans! Thumbs up to upside down pumpkin crumb cake! Ever since trying the famous 12-layer coconut cake from Peninsula Grill in Charleston, I've had coconut cake on my radar. Any time I've seen a recipe, I pin it or bookmark it. My mom and I pretty much drooled over the coconut cake at Peninsula, so I knew she would love a coconut cake for Mother's Day. Any holiday should be celebrated with cake. A full 12-layer cake sounded a little daunting, so I opted for a four-layer, 6 inch cake. This recipe uses spring form pans, which makes getting the cakes out the pan a snap, but if you don't have spring forms you can find 6 inch round pans at most craft or baking stores. Preheat your oven to 350 degrees. Parchment line two 6 inch spring form or round pans. Whisk the flour, baking powder, salt and coconut in a large bowl then set aside. Cream butter and sugar in an electric mixer until fluffy. Add eggs and egg whites one at a time, beating after each addition. In a small bowl combine the coconut milk and vanilla extract. Turn mixer to low, add a third of the dry ingredients, then mix. Add half of the wet ingredients, then mix. Add another third of the dry ingredients, followed by the rest of the wet ingredients, then finish with the dry. 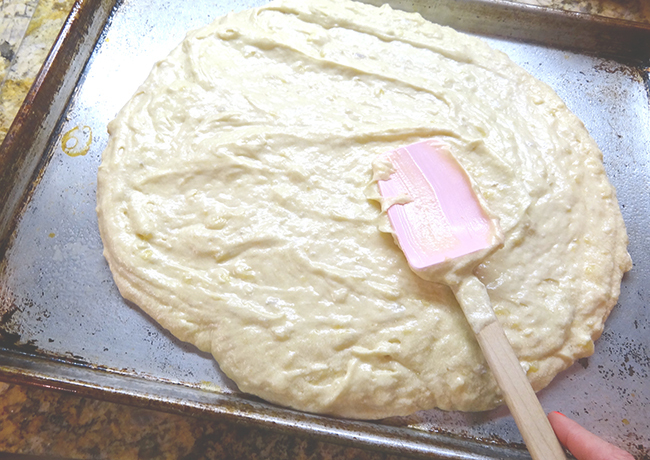 Divide the batter evenly into your two pans. Bake for 45 minutes. Do a toothpick test to make sure your cakes are cooked through. Cool completely. While your cakes are cooling, whisk egg whites and sugar in a double broiler (A metal bowl over a pot of simmering water). Continue whisking until you can't feel the sugar granules when you rub the mixture between your fingers. Transfer the mixture to an electric mixer fitted with the whisk attachment. Whip on high until it turns white and doubles in size. Add the extract. Finally, add the butter cubes at a time. Add the coconut. It may take a while to come together but once it does, store in the fridge until you are ready to frost. (Because there is so much butter it can get kind of melty). Using a serrated knife, slice each cake in half. Layer one slice of cake topped with about 1/3 cup of frosting. Continue to layer and frost until you have four layers. (Make sure you save enough frosting to cover the whole cake.) Frost the top and sides of the cake. Garnish with a sprinkle of coconut around the edges! Keep in the fridge for a nice cold and firm cake until you are ready to serve! Did anyone ever learn that "I'm a Nut" song at summer camp? With all this coconut talk its pretty much been stuck in my head the whole time while writing this post. "I'm a little coconut, sitting under a coconut tree. Everybody steps on me, that is why I'm cracked you see. I'm a nut, in a rut, I'm cra-a-zy." What do I always do when I'm at home? Bake. What should you do when you have over-ripe bananas? Bake them. I looooove this recipe and I'm so excited to share. It's an old family recipe that actually comes from my dad's company cookbook circa 1991. It all started out when my mom and I were sorting through our old cookbooks to see what we could sell and what we could keep because...big news...the Tuckers are moving!! The rents are moving out of the suburbs and headed to the big city. We have to be out of the house in 40 days so it is crunch time as far as packing and cleaning out the house. I had actually been thinking about this cake last week, so when I discovered the cookbook with the recipe in it, and mom happened to have four perfectly ripe bananas, it only seemed logical to make this cake. I have to say the star of the recipe is the cream cheese frosting. I've used it a number of times on various things. I can easily say it is the best cream cheese frosting recipe. 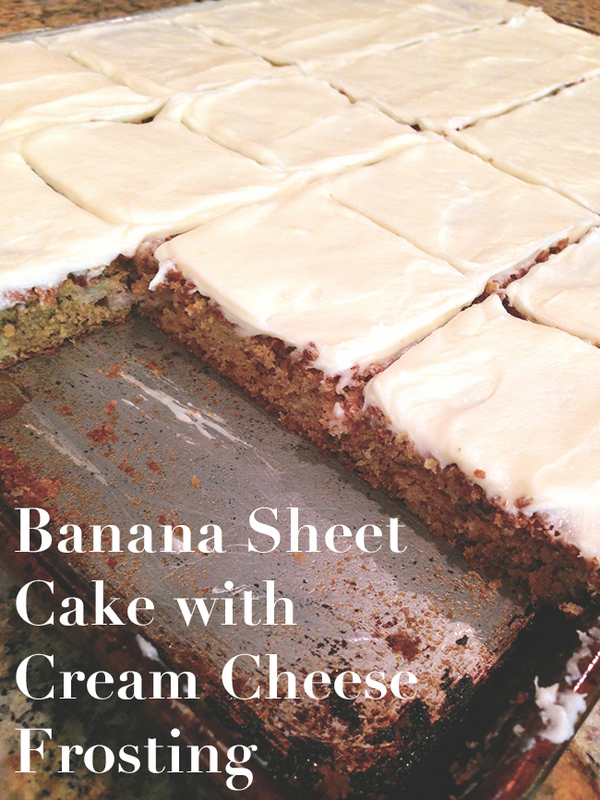 Ripe bananas, sugar, butter and cream cheese frosting. What could be better? Preheat oven to 350 degrees. Cream shortening and sugar. Add the the eggs and beat until combined. Using a fork, mash the bananas so they mix in better. 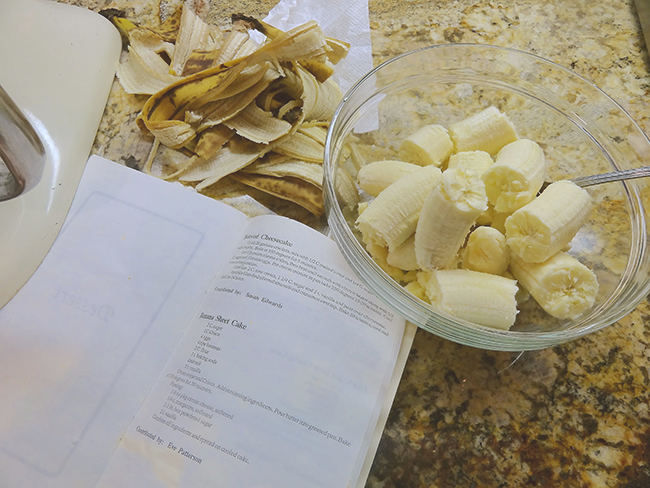 Then, add the bananas, baking soda, flour, salt and vanilla. Spread the batter into a greased pan and bake for 30 minutes. After the cake comes out of the oven, allow the cake to cool while you make the frosting. I always use a whisk attachment when making frosting, but feel free to use a handheld mixer or the paddle attachment. Whisk the cream cheese and butter first. Then add the powdered sugar and vanilla. Once your cake has cooled, frost it and enjoy! p.s. if you use a 9X13 you will have a thicker layer of frosting. Thank you to all my taste-testers. I think it was a success.